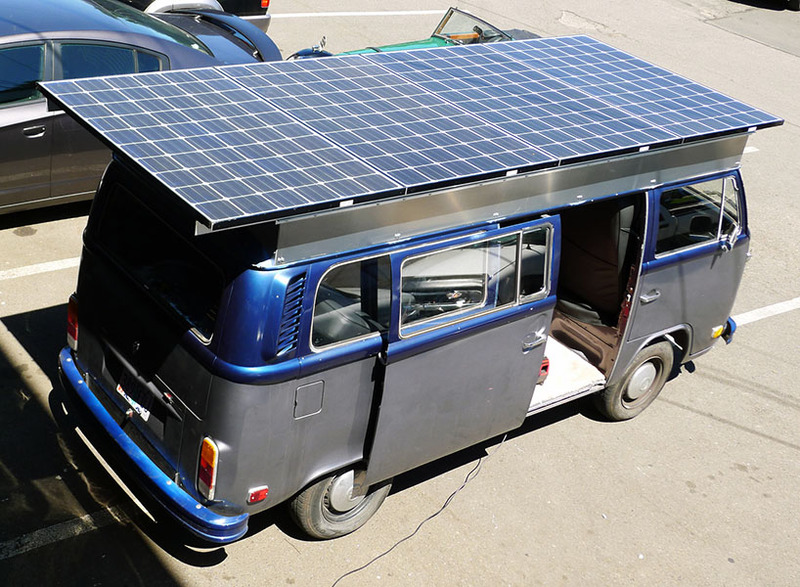 brett belen has been a builder of solar electric vehicles for years, making cars that could be simply refuelled by parking them in the sun. 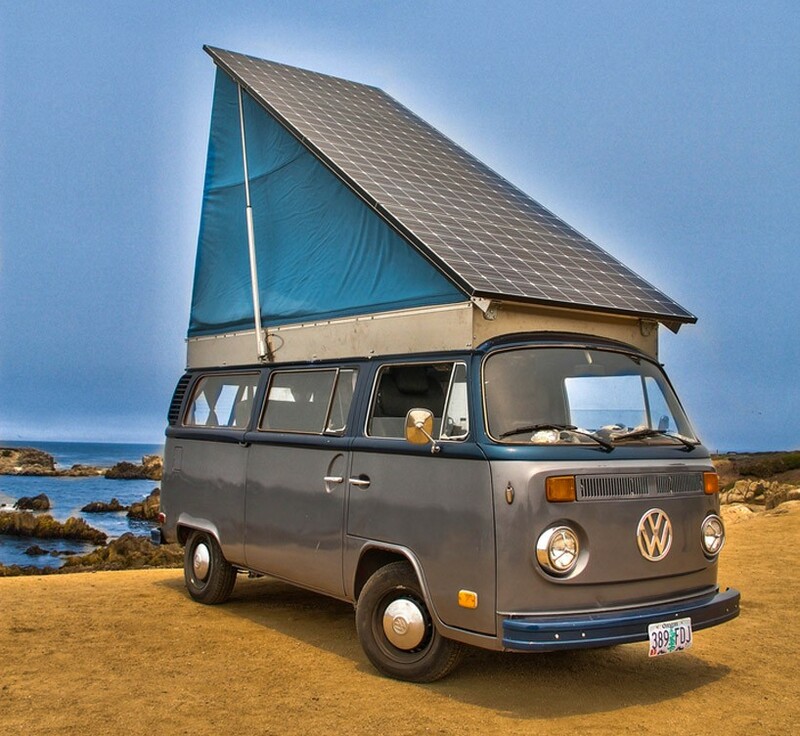 for his most recent project, he chose the iconic volkswagen bus for its interior cabin volume and surface area of its roof. 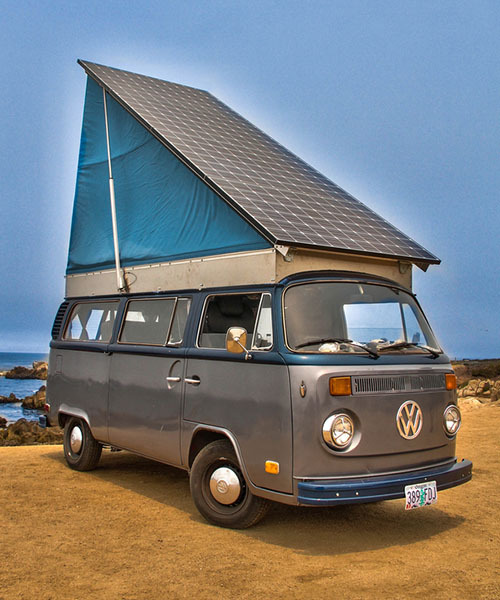 belen imagined a large photovoltaic array that could tilt for maximum solar exposure, soon realizing that the large space beneath the panels could also offer some more elbow room within the vehicle itself. 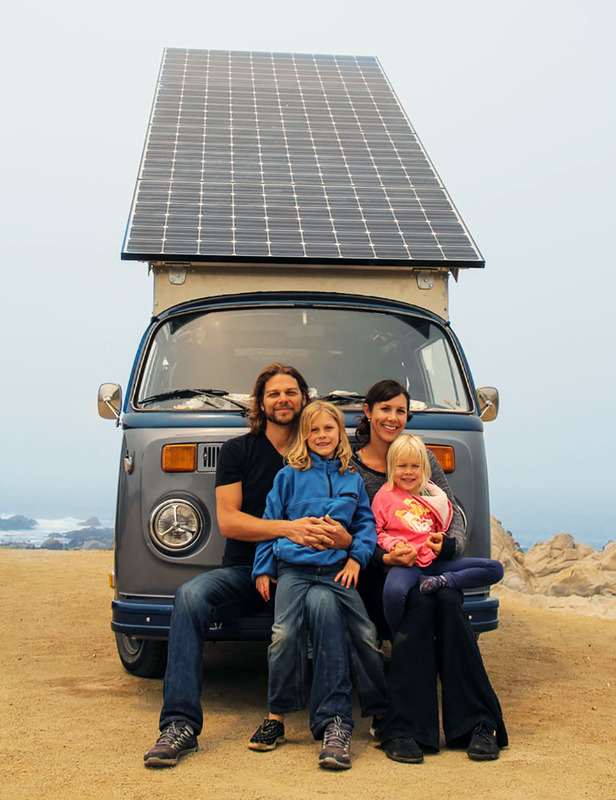 the roof is comprised of 4,305 watt LG panels, with the 1,220 watt array pivots in the front of the van. the space above can be accessed from below via the van’s ‘moon roof’. actuators tilt the array up to a maximum of about 40°, adjustable for maximizing output. with an 180° spin of the vehicle, belen can position the array to catch the morning sun. at full tilt it has 40 degrees of an angle allowing it face the sun directly for far over six hours. moving the van ensures that it can always has optimum exposure. 4 x drok DC-DC converters boost each panels’ voltage from 40 V to 55 V. these converters are wired in series for around 220 V. the array can theoretically put out 8 amps total at 150 volts into the battery. 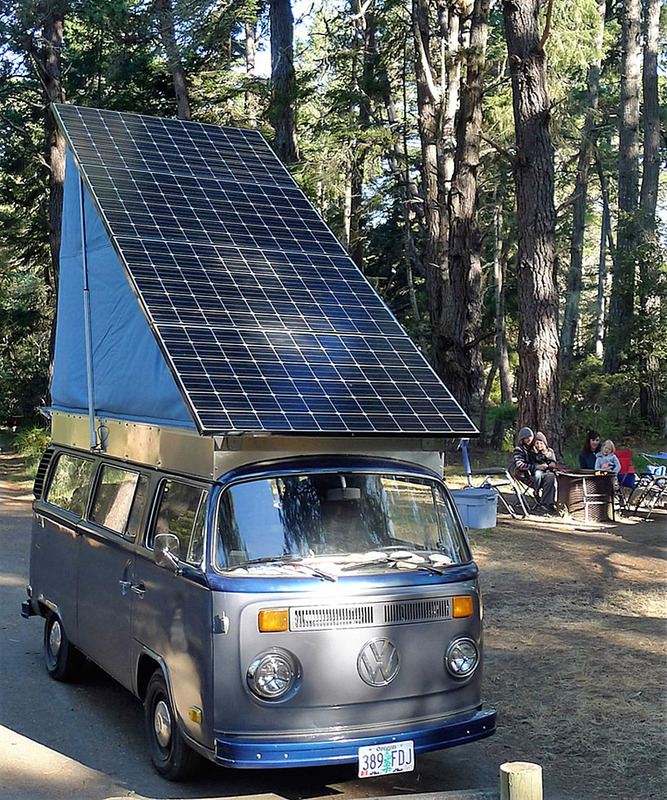 the ‘solar electric volkswagen camper van‘ features twelve trojan ‘T-1275’ lead-acid batteries provide 150 AH at a 20-hour rate. series connections boost it to a 144 volt nominal voltage. there is a 12 meter display on the dash (one to monitor each battery). the batteries are sat beneath his kids’ seat so monitoring the state of each battery is an important safety feature. it takes just longer than a day to fully charge the battery bank (depending on the length of day; and geographical location), and an average day of charging at the belens’ home in ashland, oregon, produces a range of about 15-20 miles of city driving. 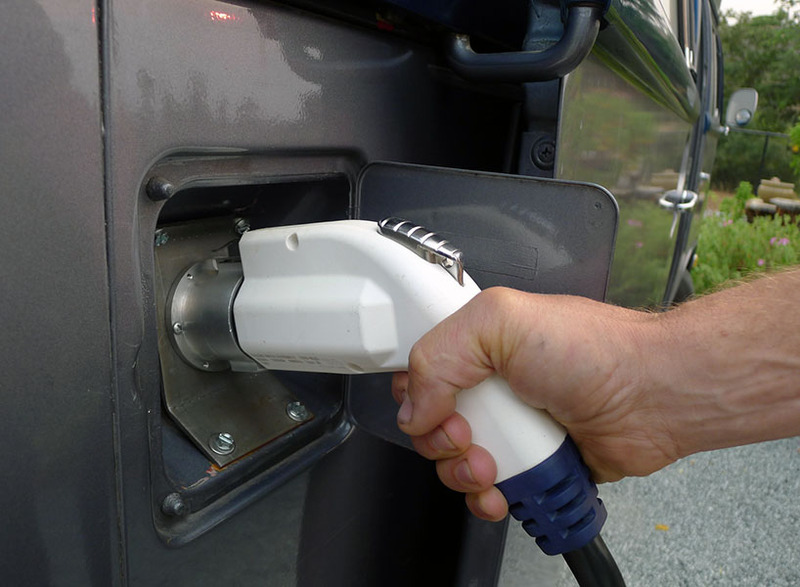 the vehicle can also be charged via a grid connection, with a full battery recharge taking about two hours and 20 minutes. Here is the gold standard for solar vehicles. http://sinovoltaics.com/technology/stella-lux-winner-of-world-solar-challenge-visits-shanghai/ This car can travel 932 miles on one charge and solar during travel over two days. That is about 45kw or 621 miles per gallon E. It has a range of 400 miles on it’s 15kw battery at night.